Dr Alex Opoku is currently the Director for the Centre for Sustainability and Resilient Infrastructure & Communities at the London South Bank University, School of Built Environment & Architecture. He is a Senior Lecturer and also the Course Director for the MSc Quantity Surveying programme. Dr Alex Opoku is currently the Director for the Centre for Sustainability and Resilient Infrastructure & Communities at the London South Bank University, School of Built Environment & Architecture. He is a Senior Lecturer and also the Course Director for the MSc Quantity Surveying programme. Alex previously worked as a Postdoctoral Research Associate at the University of Cambridge, Centre for Sustainable Development in the Department of Engineering before joining London South Bank University in 2013. He holds a PhD in Construction & Project Management from the School of Built Environment, University of Salford in the UK. 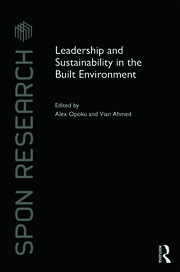 Alex’s main research interest is in the area of Sustainable Built Environment. He has extensive quantity surveying/cost management experience in the UK construction industry.